I volunteer at the Southside branch of the Santa Fe Library in the Children’s Room and every week two very special volunteers work along with me, Bernice Pearl and Ethel Trujillo. Both Bernice and Ethel also volunteer at other nonprofits, but today I will tell you of their very special gifts of textiles to the community. Bernice is a transported New Yorker and one of the busiest women I know. Her gift is knitting hats, not just a dozen or so a year, but most probably, hundreds of warm, colorful hats, which she donates to shelters, hospitals and organizations in Santa Fe and throughout New Mexico. If I see someone, perhaps at a bus stop, wearing a stripped knitted hat on a cold morning, I could guess from where it came. Ethel belongs to a Prayer Shawl Ministry group, called the Sewing Angels, at her parish, Santa Maria de la Paz. They knit and crochet prayer shawls, afghans, baby blankets and hats and donate them wherever there is a need, here as well as missions as far as Guatemala. 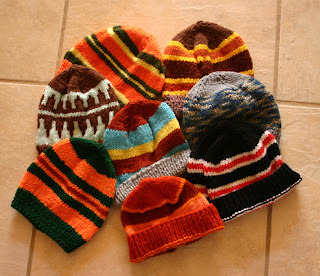 Some of Ethel’s baby hats have traveled far to China. Their current project is to make baby blankets for two organizations who distribute them where they are needed. As you can see these are exquisitely created with much care and love. So today I will write about knitting and crochet work. Both of these techniques are categorized as Single Element structures, which means working a single element (thread or yarn) with itself. Other examples are linking and looping and knotted looping. 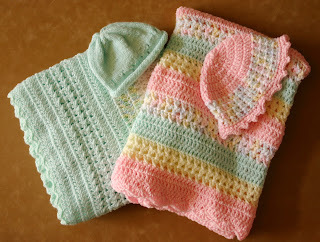 Knitting and crochet are considered inter-looping because the loops of yarn are drawn through previously worked stitches. 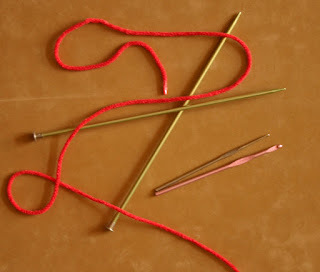 In knitting the loops are worked vertically and if one loop is missed or damaged the entire row of vertical stitches will be released, although not adjacent stitches. This accounts for the unfortunate event of “snagging” stockings, resulting in a “run”, both obvious and costly as the stocking is then ruined. Fortunately, modern construction techniques have somewhat eliminated this mishap. Crochet is worked both vertically and laterally and each new stitch is secured as soon as it is completed. Because of this, the combination of stitches is vast and patterns are nearly limitless. The history of knitting is an old one. The word comes from Anglo-Saxon “cynttan”. Which means creating by hand. Examples in Egyptian tombs date as early as the 5th C B.C. and knitting was widely known throughout Europe by the 14thC. The first knitting machine was introduced in 1589, and the first power knitting machine in 1832 in America and in 1851 in England. Crochet is a more modern handwork, known in Europe since the 16thC, chiefly practiced by nuns and classified as ‘nun’s work” along with lace-making and embroidery. It became fashionable in England and Scotland in the first half of the 1800’s. The word “crochet” is from the French, “croches, or croc” and the Danish “krooke” (hook). Today these types of “handwork” remain extremely popular and many yarns of wonderful textures and glorious colors are readily available. It is still possible to find lovely, older, examples of crochet and knitted work in thrift shops, antique shops and nearly everyone’s grandmother’s attic.